Nowadays, Saudi Arabia is receiving thousands of air flights carrying hundreds of thousands, even millions, of Muslims coming from all corners of the worlds to perform Hajj, the fifth pillar of Islam. For a true Muslim, this is a very special journey. No other travel, whatever the attraction or spectacular scenes it may include, can be comparable to this journey to Makkah and the holy sites. 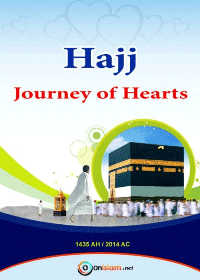 One aspect that makes the journey of Hajj so unique is that, rather than focusing on the material attractions and physical pleasures, it nourishes the spiritual and inner side of the human being. It focuses on the welfare of the most important component of a human that is often ignored and neglected, namely the soul and heart.